The Contest Card is a legacy product and is no longer available. 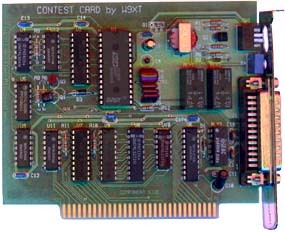 The Contest Card is a PC plug-in interface board that contains a voice keyer and CW interface. With the Contest Card, you simply record your CQs, call sign, signal reports, etc., and play them back through your PC with the touch of a key. A voice keyer is to phone operating what an electronic memory keyer is to CW. Save your voice during those long operating sessions! For the radio contester, the Contest Card, along with your favorite logging program, turns your PC into a contest machine. DXers, now you can jump into those late night phone pile ups without disturbing the rest of the family! VHF operators are using the Contest Card for their meteor scatter transmission sequences. Naturally the Contest Card is compatible with the premier logging programs, including CT, NA, TR-LOG and LogEQF. Separate programs, including a pop-up TSR, are included with the Contest Card to control the voice keyer. For those who like to write their own programs for contesting or other applications, the disk also includes programming information for the Contest Card. Unlike other voice keyers that fit in your PC, the Contest Card does not use computer memory or disk space to store voice messages. You record with your regular transmitter microphone, so your recorded voice sounds just like live. You don't use a $2 microphone on your transmitter. Why use one on your voice recorder? The Contest Card automatically switches the microphone for recording and play back. The rest of the time your microphone is isolated from the computer and connects directly to the transmitter, even when the computer is turned off! Audio is stored internally in non-volatile memory. This means that your recorded messages are still there even if you lose power or turn off your computer. The built in voice keyer's 60 seconds of high quality audio is split into 4 segments, each approximately 15 seconds long. The Contest Card also includes a built in CW interface. Most contest logging programs support sending flawless CW with the press of a key. Unlike interfaces using the COM or LPT ports, the Contest Card works with both positive and negatively keyed rigs. No more worrying if your computer will work with someone else's radio at Field Day! Since the Contest Card contains both a voice keyer and CW interface on a single card, you free up your LPT and COM ports. Save the LPT for your printer and the COM ports for your modem, packet TNC, and controlling your radio. No more swapping cables all around when you want to operate a contest! The Contest Card is simply the best way to integrate your radio equipment and PC. Putting it in the computer frees up space on your operating table that is probably already filled up with your rig, computer, packet TNC, rotor controls, antenna switches and other accessories. There is also one less plug for the AC outlet. Cut down on the clutter! The contest card is available assembled and tested for $149.95. See below to order. The manual contains complete schematics. Cable to your microphone and radio not included but available below at an additional cost. See the 1995, 1996 or 1997 ARRL Handbooks or the Sept. 1993 QST technical article describing the Contest Card! NOTE: The Contest Card is designed to plug into ISA type PC bus slots. Most new PCs no longer support this bus. Please check your PC before ordering a Contest Card. If your PC does not have an ISA slot, please consider our VK-64 instead. Contest Card Cables now available! Unified Microsystems now supplies Contest Card cables for most popular radios for just $44.95. These come as a semi-kit. The hard part is done for you! All of the wiring is done except for the connectors to your microphone and transmitter. The wires to these connectors come pre-stripped and tinned for quick and painless final assembly to match the pin out requirements for your particular equipment. Instructions included. Specify 4 or 8 pin microphone connectors. Email for pricing information on completely assembled and custom length cables.